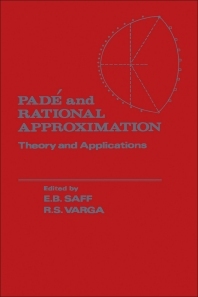 Padé and Rational Approximation: Theory and Applications presents the proceedings of the Conference on Rational Approximation with Emphasis on Applications of Padé Approximants, held in Tampa, Florida on December 15-17, 1976. The contributors focus on the interplay of theory, computation, and physical applications. This book is composed of six parts encompassing 44 chapters. The introductory part discusses the general theory of orthogonal polynomials that is the mathematical basis of Padé approximants and related matters evaluation. This text also examines the connection between approximants on a stepline in the ordinary Padé table and certain continued fractions and the convergence of diagonal Padé approximants to a class of functions with an even number of branch points. The following parts deal with the special functions and continued fractions of Padé approximation and the theory of rational approximations. These parts also investigate the geometric convergence of Chebyshev rational approximation on the half line, the optimal approximation by “Almost Classical” interpolation, and the incomplete polynomials approximation. The discussion then shifts to the physical applications and computations of the Padé approximants. The concluding part presents the applications of rational approximation to gun fire control and to the White Sands Missile Range Computer Facility. This part also provides a list of some open problems and conjectures concerning polynomials and rational functions. This book is of great benefit to mathematicians, physicists, and laboratory workers.